As you continue to construct the test pyramid for your iOS apps to Martin Fowler’s specification, you’ll find the desire to separately measure your code coverage for both unit tests and functional tests. And if you don’t have that desire, then you should know that measuring a combined code coverage for both unit and functional tests is not an accurate representation of how your production code is truly covered. For one, functional tests will generally have a higher coverage, while also including less assertions. This is because of how much code gets executed while broadly navigating through your app as functional testing does. This data will then be glom’d on to the code coverage metrics for your unit tests, making it really hard to identify where you can refine the coverage of your unit tests. And the opposite can also be true, where you have unit test coverage and no functional test coverage, but since you are only evaluating a single number, you can’t figure out where one ends and one begins. To fix this, use separate schemes for better iOS code coverage. 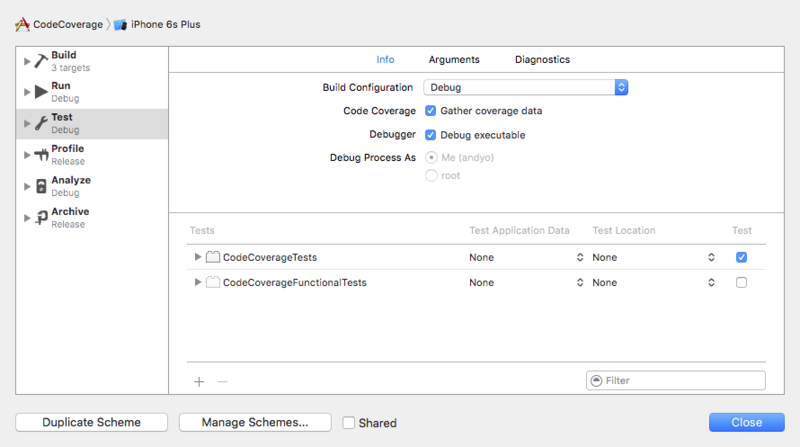 By moving each group of tests into their own scheme, you’ll be able to measure code coverage independently. To fix this, you are going to create separate schemes for better iOS code coverage. To start, you are going to duplicate the main scheme for your app, and then specify a different set of tests for each scheme. I’ll walk you through creating a separate scheme for your unit and functional tests. For this example, we’ll be using KIF as the tool for the functional tests (Yes, soon enough I’m going to take a deep dive into Xcode’s new UI tests). For this walkthrough, you’re going to continue with the project from Wednesday where you setup code coverage for unit tests. You can find the project on GitHub if you just want to start there. https://github.com/obuseme/CodeCoverage. To start, open the Scheme Editor and duplicate the one and only scheme. The new, duplicate, scheme that you created will be used for executing your functional tests, while the initial scheme will be used for your unit tests. The benefit of this is that you’ll be able to separately calculate code coverage for each set of tests. The drawback is that you’ll need to manually switch the scheme to execute each set of tests. After you’ve duplicated the scheme, rename the new scheme to CodeCoverageFunctionalTests. 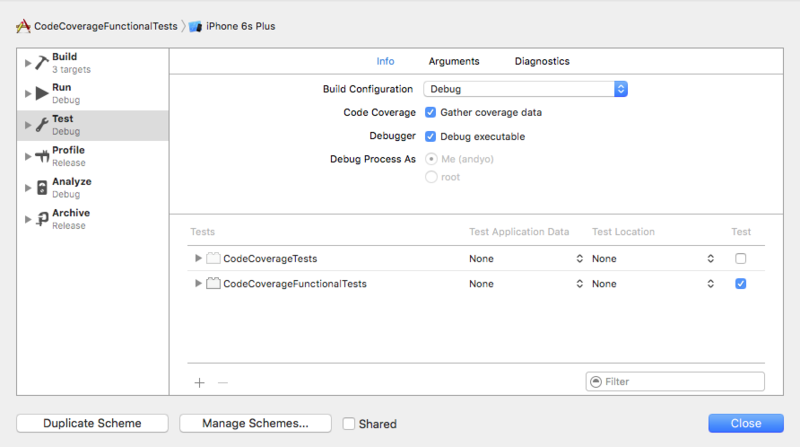 Next, create a new “iOS Unit Testing Bundle” target named CodeCoverageFunctionalTests. This target will contain your KIF tests. Next, install KIF, preferably with CocoaPods. For detailed instructions on doing this, follow my previous post here. Ensure that the target you specify for where KIF should be installed is CodeCoverageFunctionalTests. And of course, after first configuring CocoaPods with a project, after you install pods for the first time, close CodeCoverage.xcodeproj and open CodeCoverage.xcworkspace instead. And for the final step, edit each scheme to selectively use one of the two test targets for its Test step. First, edit the scheme for CodeCoverage and set the test suite for the Test step to be CodeCoverage. 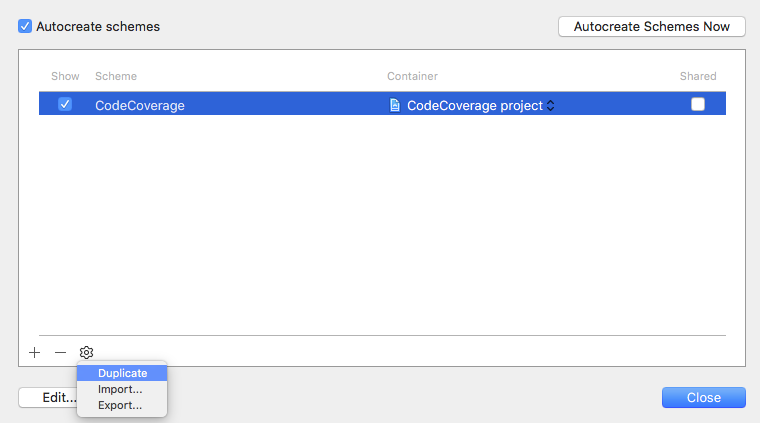 Make sure Gather code coverage is selected as well in each scheme. Then, edit the scheme for CodeCoverageFunctionalTests and set the test suite for the Test step to be CodeCoverageFunctionalTests. BOOM! That’s it. Now you can explicitly change schemes, and use Command-u to run tests for each scheme. Depending on the scheme selected, a different set of tests will be run – either the unit tests or the functional tests, and as a result, different code coverage metrics will be generated. This post concludes a week of code coverage information. I hope you enjoyed it, and I hope your tests are better covered as a result separate schemes for better iOS code coverage. I’d love to hear how you’re using code coverage. Please post a comment and let me know!